With a foreword by Neal Barnard, M.D. 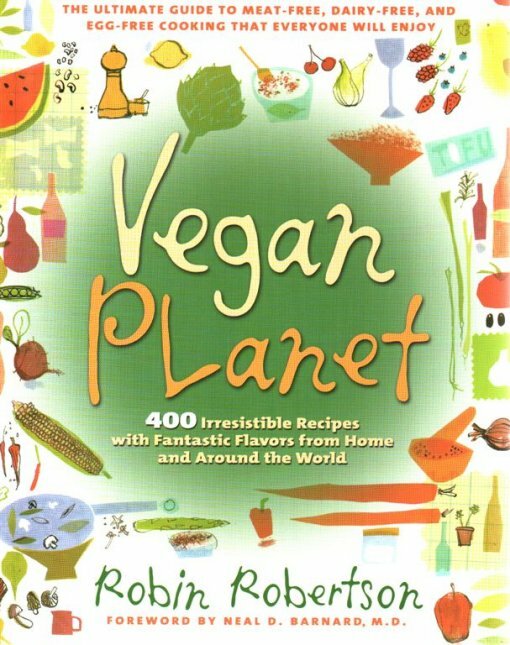 Vegan Planet introduces a world of delicious choices to the millions of Americans who are vegans, vegetarians looking to move away from dairy and eggs, or nonvegetarians who have food sensitivities (more than 30 million Americans are lactose intolerant) or are simply trying to eat healthier. A vegan diet contains no eggs, dairy, or other animal products, including honey, but is chock full of delicious nutritious, and satisfying whole grains, vegetables, fruits, and proteins from plant sources. 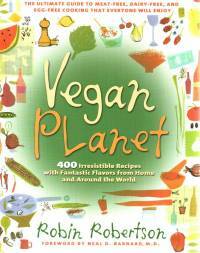 In Vegan Planet, Robin Robertson shows how to make vegan cuisine exciting, flavorful, and full of variety. First she provides a complete rundown on the vegan pantry and the tremendous health benefits of eating vegan. Then she presents 400 tantalizing new recipes for breakfast (Pumpkin Pie Pancakes), lunch (Portobello Fajitas) and creative ideas for entertaining guests (Ginger-Scented Pot Stickers, Curried Cauliflower Pakoras). Taking advantage of the many cuisines around the world with large repertoires of naturally vegan recipes, Vegan Planet is truly global in its culinary offerings.